Agency owners often have similar concerns about new business. Here are some of the questions I’m asked most frequently, and my answers. How do I know what clients I should be targeting? How do I get better performance from my agency new business person? How do I get better at generating agency new business? What’s the environment for new business like? Are there opportunities out there? Are you still seeing this as a project-based environment? Do you think AOR-type opportunities will be coming back? Are there any industries that are seeing more opportunities than others? What are prospects looking for in terms of work? Do you see other agencies losing business to consultancies or in-house agencies? First of all, you need to know which of your clients and what type of work is most profitable for your agency. Based on data, not your best guess. Proposify has written about some of the KPIs you should track to make that determination. Next, do a fresh assessment of your agency’s position. What are you most competitive for, and with whom? Where are your best opportunities? Factor in your past and current work, your available talent, location, and your agency’s reputation. Are you doing the work that you want to be doing? If not, what would it take (realistically) to grow in another direction (new hires, new kinds of work, new accounts, new verticals)? Once you’ve worked through those questions, ask if that is consistent with your positioning and the way you present your agency on your website. If not, make some changes first. And if yes, then you need to work on a list of leads. You should start with a small, well-curated list of brands that aren’t unrealistic “reaches.” Refine your list by company size, industry, location, ad spend, contact role, and other factors. Everyone on your list should be consistent with the types of targets that are profitable for your agency and represent work that you want to be doing. You should also be able to articulate a compelling argument as to why your agency is worth their time. Agency new business professionals have a high turnover rate, often because there is a discrepancy between the expectations for their performance and the length of the sales cycle, combined with insufficient resources in place for the new business person to succeed. Think about how and why you hired them in the first place. Did you use a sales assessment tool and get help vetting candidates from a sales expert? Do you have an onboarding process for salespeople? Have you clearly defined (attainable) expectations and benchmarks? - Does your agency have a business plan and well-defined sales process that you are committed to and is applied consistently throughout the organization? - Is your agency’s positioning clear, compelling, and consistent? - Do you have supporting materials like case studies and thought leadership content? - Do you have a CMS, CRM, and other tech tools to support agency new business? - Does your new business person have adequate time to devote to new business activities, or are they pulled into other tasks? - Who are they accountable to? Who is managing them and holding them to task regularly? Could outsourced sales coaching or management help keep them on track and improve their performance? - Are they isolated from the rest of your team? How is communication and collaboration between your new business person and other employees? If, after considering these factors, you remain convinced you have someone who is simply unable to perform and nothing you do will change that, then it may be that you have just hired the wrong person. Should you hire someone new? I’ve outlined some considerations here. Commit to making new business a priority: set your goals, track your activities and results, and make time to work towards new business every week. Invest in developing your team’s sales skills and teach them how to upsell. Invest in developing your own sales and presentation skills if necessary. Don’t mistake marketing activities for sales activities — marketing activities have value, but they aren’t going to close new business for you. Invest in marketing activities (including thought leadership) strategically so that those efforts are aligned with your new business goals. And be persistent in your pursuit of sales activities (like outreach emails and phone calls). Here’s a summary of the industry environment. Earlier this year, AdAge published a report that found U.S. agency revenue had grown a sluggish 1.8 percent in 2017, the slowest growth since the ad market emerged from recession in 2010. They reported all major agency disciplines are slowing, which they attribute to job cuts, weak organic growth, slumping stock prices, and a tightening of market budgets. (On the other hand, they reported that consultancies were thriving). 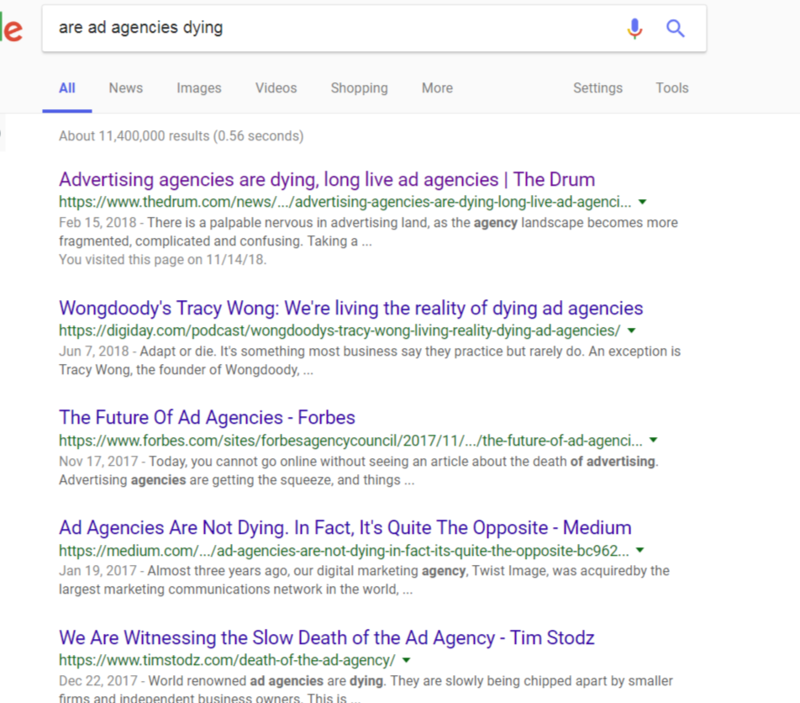 I just did a search query for “are ad agencies dying” and got 11,400,000 results. Surely many of those are not relevant. And I don’t think ad agencies are dying. My point is, it’s been a topic of conversation and debate because ad agencies of the past are under threat. Those who can’t evolve into agencies of the future are in trouble. Honestly, I think people ask this question when they already know the answer; we’ve all seen the data and industry news which consistently point in this direction. But that’s not what agency owners necessarily want to hear. What I think they want to hear is: everything is going to be alright, just give it some time and the pendulum will swing back, or this only affects certain kinds of agencies other than theirs. But that’s not true. All sources will tell you the ad industry is challenged and the traditional agency model is threatened. However, does that mean there is no new business to be found? Absolutely not! Agencies are still winning new business all the time. What new business looks like — and how its won — is changing, as I’ll explain more below. But make no mistake — agencies are still working with brands, building new relationships with brands, doing projects for brands, expanding their opportunities with brands, and even still landing plum AOR contracts from time to time. Brands still want to engage new agencies. If your agency is great at what they do and not resistant to change, you should be able to sleep well enough at night. I do think agencies need to be more strategic than ever about their current and future position and be proactive about making changes to stay competitive and continue to attract new business. AOR-type opportunities are on the decline, and those that do exist are increasingly being awarded to agencies with whom there is already an established relationship and proven results. So yes, more and more opportunities, of all sizes (AOR or not) start with an initial project to test the waters. We have seen a number of higher-profile AOR opportunities won recently without a pitch process, which agencies have been able to grow out of smaller initial projects. This is a change, and change can be unsettling, but in my view, it is not a bad thing. It is much more cost-effective for an agency to take on a project with growth potential than to waste so many resources going through the pitch process. Not only is it doubtful that AOR opportunities will make a big comeback, but I’m not sure that would be an ideal outcome. This is one change that may be for the better. So don’t thumb your nose at project work if the client is right! Just going based on revenue growth within the advertising industry (as reported by AdAge), digital and media agencies, CRM/direct marketing, and promotion are the agency sectors that are seeing the greatest growth. Media agency revenues outside of digital work are in steep decline. PR has had very little revenue growth, as with traditional ad agencies. AdAge didn’t track experiential agencies as a standalone category, but they are also seeing a lot of growth. Direct mail, newspaper, and magazine spend are on the decline, according to Zenith’s U.S. spending forecasts (AdAge’s Marketing Fact Pack 2018). GroupM’s spending forecasts also revealed a decline in mail and newspaper spend. Beyond that, I would look at larger ad industry and business trends. Platforms like Amazon, Google, and Facebook are giants, and they are set up to facilitate relationships directly with brands, cutting out the agency’s traditional role as a middleman. So if you can find a way to offer something that brands still need as they navigate these platforms, you might create some opportunity. Earlier this year, Forbes published a list of the most profitable industries by state, so that could be another place to look for ideas. Cannabis is obviously one of the most well-known new opportunities. If you already have experience with related niches like food & beverage, pharmaceuticals, or beer, wine and spirits, then you may be able to leverage that for opportunities with cannabis brands. As I mentioned previously, more of the work is project-based. Brands are looking for more collaborative relationships with agencies which allow them to have more control, and which are built on trust, transparency, and fast response. Smaller agencies and others that are in a position to be most flexible will likely fare the best. For example, marketers may be more interested in agencies who can place teams on-site. Digiday has reported that marketers want to do more planning and strategy and have more direct relationships with their customers while delegating more execution to agencies. 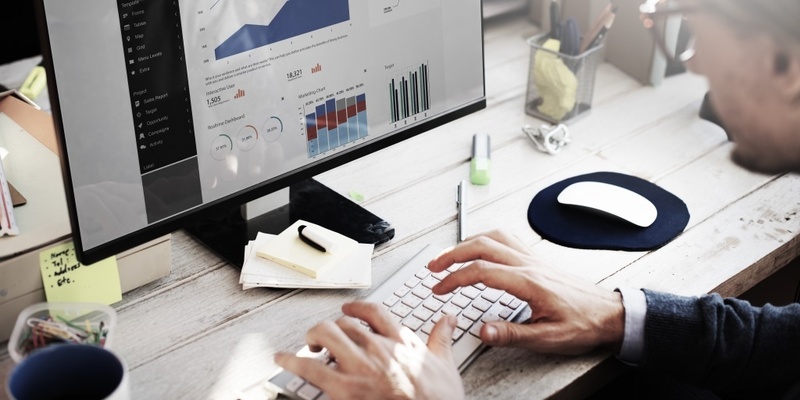 Data and technological expertise are increasingly important for agencies, though some brands are taking that in-house (ANA). Definitely, brands are wanting to own and control their own data. Great creative will always be in demand, but content creation is also on the list of things some brands are taking in-house (ANA). 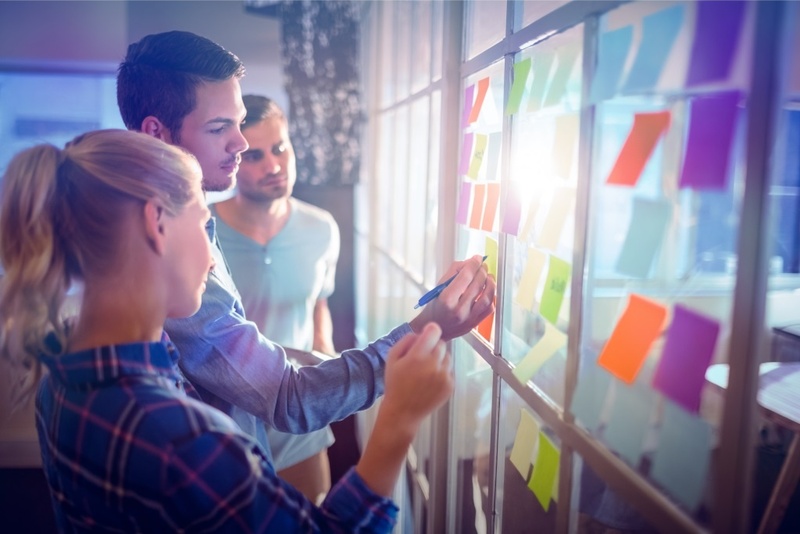 Specialized expertise, diverse experience, expert outsider perspective, collaboration, flexibility, speed, access to and management of talent, those are all things that marketers look to agencies for and which agencies may have going in their favor. As brands take more work in-house, they are becoming much savvier. This makes them potentially better partners, and it also raises the bar as far as their expectations on what agencies deliver. At the end of the day, besides interpersonal chemistry, geography, and all the other obvious limiting factors, brands usually choose agencies based on their ability to demonstrate expertise in their industry and a proven history of delivering business results and solving client problems. Exceptional creative is expected of anyone invited to the table. The difference tends to come down to expertise and proven ability to deliver bottom-line results. A lot of questions from agencies are reactive, and this is a perfect example. People often want to know, “What are my competitors doing? What is everyone else doing?” Instead of asking: “What can I do? What should I be doing?” Even just how the questions are asked, how people are thinking about it says a lot. Don’t be like every other agency. You should offer something that is unique from others. So even if every other interchangeable agency loses business, that doesn’t need to be your agency’s story. Some of these agencies aren’t going to last; they will get swallowed up, shut their doors, or be reincarnated as something else entirely. That’s inevitable. If you sit and wait for things to happen to you, maybe that will be your agency’s fate too. So what are you doing to take charge of your agency’s destiny? What changes are you making to keep up with the changing landscape? The other part of that question, is yes, just look at the trends; clearly, agencies are losing business to consultancies and in-house agencies. That is happening. What you should be most concerned with is not what is happening to other agencies, but what is going on with your agency, and what you are doing proactively to prepare for the changing new business environment. How can you make your agency indispensable? And for this, you need to let go of any ego or sentimentality, any wishful thinking, and look at it objectively, as an outsider would. Don’t gloss over your agency’s shortcomings, get real about them, and the gap between where you are and where you need to be in order to attract and retain new business. Burying your head in the sand and continuing to do business as usual is not a good solution. I hope you found this helpful. If you have additional questions, please add them in the comments below. Image credits: frequently-asked questions about agency new business ©Adobe Stock/Rawpixel.com; opportunities for agency new business ©Adobe Stock/Rawpixel.com; what agency owners want to know ©Adobe Stock/vectorfusionart.